For Adi Ateca Tuwai football has been an immense force in helping her heal following the tragic passing of her best friend and mentor. Francine Lockington passed away last year, and losing her teammate inspired her to try and live up to the potential Lockington will cannot. “It was the saddest moment of my life when Francine fell sick and was hospitalised before our departure to New Zealand for the OFC U-19 Championship last year,” Tuwai said. 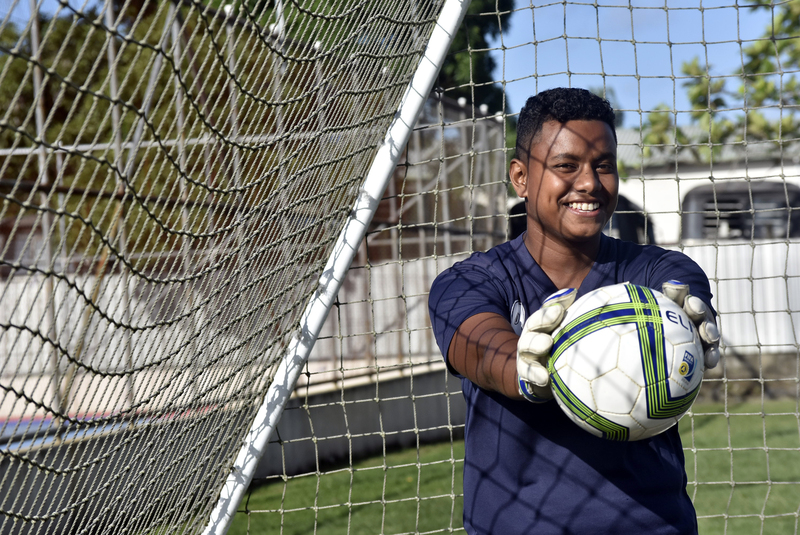 Before falling ill and while in camp with the Fiji U-19 women’s team, Tuwai said Lockington had been a guiding light for her; offering advice, teaching her and molding her into a talented goalkeeper in her own right. “I was in pain but her words gave me strength as I stood between the goal posts playing for my country and for her,” Tuwai said. A positive outlook and, importantly, her enduring love for football have all been crucial elements in Tuwai’s success at the championship and till now. She was awarded with the Golden Glove award during the OFC U-19 Girls Championship in New Zealand last year for the most outstanding goal keeper. Tuwai dedicated her award to her late friend. “I remember her words when she told me to be vocal because I was quiet always and with her I learnt to talk with my teammates,” the Ba women’s goalkeeper added. Now she is aiming for a spot in the Vodafone Fiji national women’s team for the OFC Women’s Nations Cup and will continue to heed the advice Lockington shared with her. Tuwai, originally from Nailaga Ba, began playing with a ball as an eight-year-old and comes from a long line of footballers including her father, uncle and brothers who are all equally keen footballers. Tuwai said her interest in football grew while accompanying her uncle Taito Bula to every match he played. “My uncle Taito Bula used to play for Ba and the Fiji team and he always took me to the grounds whenever he had a match to play and watching him out there on the field is where my interest in football grew. “Football was always present in my life,” she said. At 13, Tuwai was encouraged by her friend Maria Lewaseini to join Ba with her. “Maria asked me to accompany her to the Ba training and I did as football was in my blood so it was an easy decision,” she said. She remembers her first match as in goal as being very interesting and challenging. “When I stood between the posts I knew nothing about being a goalkeeper but watching football gave me some idea how to play and I have never regretted taking this position. She said her passion and love for the sport has only continued to grow and she was happy to be part of her district and national team. Tuwai said one of the things she likes about the position is that it takes a lot of work to keep improving. “The position of goalkeeper requires years of hard work and focused training. Goalkeepers practice dribbling and passing the ball with field players and jumping and diving for the ball. The position requires balance, hand-eye coordination, agility and a strong mental focus. “The goalkeeper is the last line of defence to prevent the other team from scoring. The goalkeeper can punch the ball, catch the ball or kick the ball back into play and that is why I enjoy playing this position,” Tuwai said. She said the goalkeepers are also the eyes and ears on the field. Her advice to the young footballers is; “No matter what position you are in, you are first a football player and you will have to be able to receive, shoot, pass, dribble, head, and make space, regardless of your position on the field.